Bonded Urethane is the most economical. Prices vary depending on thickness and quality, but a 6 to 8-pound density Rebond pad generally runs about $0.39 to $0.45 per square foot. Flat rubber padding is generally the most expensive. 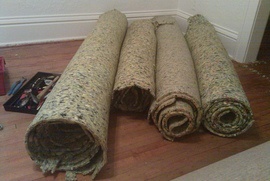 It may last through one or more sets of carpet, but is often hard to find and may need to be specially ordered--adding to the overall cost.